Gould pushed back his chair and walked toward the witness stand. The courtroom was not as large as some of the others he had seen. It was modern and low-ceilinged, with blond wood trim and polyester fabric on the chair seats, hardly grand enough, he thought, for the impact the trial would have, one way or another, on his life. But it would do, if only it were the last courtroom he ever had to see. Six federal court jurors and two alternates watched Gould make his way to the enclosed area beside the judge’s bench. They saw a man in his late sixties, sixty-seven to be precise. He wore a two-piece charcoal gray suit – that or blue, his lawyer had told him, no brown, no vests, and for God’s sake none of those little thin-soled loafers that look like dancing shoes, wear lace-up shoes so the jury knows you’re serious. It made him look serious, all right. Professorial. His high forehead topped by wavy gray hair and heavy dark-rimmed glasses hinted at the inventor his lawyer had described in his opening statement. “A very great inventor,” he had said. A handsome man, too, it might be added, with a strong square face, a prominent nose, dimpled chin, and blue eyes that sparkled with humor. For all the buttoned-down sobriety of his attire, he looked like a man who had fun, a man you could like. He stood in the witness box and spoke the oath in a quiet voice roughened by a smoker’s rasp. Gould found the chair behind him and sat down. The three or four spectator rows were loosely filled. Here in Orlando, retirees with time on their hands jostled for seats at a good murder trial, crowding in in their loud shirts and the women with pale blue sweaters for the air conditioning and everybody with newspapers folded to the crossword puzzle for when the testimony got a little slow. None of them were here. But a couple of reporters had their pens poised to make notes. Lawyers representing firms like the one Gould was suing studied him, considering his effect on their employers. Shadow jurors were sprinkled here and there, hired to gauge the way the trial was going. Gould caught the eye of his companion, Marilyn Appel, seated in the second row. She gave him a smile of support. At the defense table, expensively dressed, sat Robby van Roijen, wearing his trademark aviator sunglasses. Van Roijen was the latest in a long line of people to think they could sweep Gould under a rug and forget about him. But he kept crawling out and popping up again. It was uncanny, a performance worthy of the Energizer bunny. To his left, U.S. District Court Judge Patricia C. Fawsett, fortyish and blond, a nice contrast with the somber robes, presided. She was the third judge in the ten-year-old case. All the paper in all the cases and other matters that focused on Gould – the depositions, the transcripts, the Patent Office pleadings, the files compiled on him by the FBI and branches of the military – had accounted for the killing of a hundred forests. Gould’s lawyer turned his way. Warren Goodrich was a courtly man with gleaming hair of snowy white and a voice like honey, perfumed with the kind of homespun, folksy talk that juries loved. Gould had seen many lawyers, too. Once he had counted, and stopped at around two hundred. Goodrich was a trial litigator and something of a legend here in central Florida and Orlando, where the Control Laser Corporation had its base of operations. The patent lawyers who represented Gould had hired Goodrich for his facility with jury trials. Gould invented the laser. Sat bolt upright in bed one night in November, 1957, and wrote down the essence of the “amazing, magnificent” machine that, as Goodrich said, had changed industry and lives as well as medicine and science. Then he went out and got it notarized. Those were the last smart things he did for quite a while. 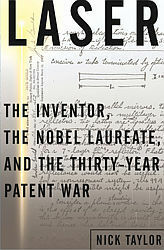 So here he sat thirty years later in what he hoped was the last of many courtrooms, wearing a conservative gray suit and serious lace-up shoes and hoping for a verdict that would force laser makers to pay him for the right to manufacture his invention. Which they were reluctant to do, and that was putting it mildly. The stakes were high. Gould figured to win or lose millions, depending on the outcome of the trial. The money was all he cared about, at least that was what he said. But in his heart, he knew it could mean vindication, too. Quite a few people refused to believe Gould had invented the laser. The thinking was, he couldn’t have. To do something important like that, you had to be a serious scientist, or at least be an acolyte to one. Poor Gordon Gould, he didn’t even have a Ph.D. And acolyte had never been a good way to describe him. So you were stuck with the insupportable notion that a thirty-seven-year-old graduate student had grasped the key to one of the more significant inventions of all time before the very serious scientist and professor working down the hall. Who, by the way, obtained the first patent on a laser and went on to win a Nobel prize before somebody figured out that the laser in his patent wouldn’t work. Gould couldn’t count the times his claims had been greeted by the sound of laughter. If they wanted to be nice, those serious scientists, they would let on that Gould was clever enough but just, well, not really serious; he doesn’t publish in our journals, you see, he doesn’t go to our meetings. If they didn’t want to be nice – and this was usually the case – they would hint that Gould had stolen his ideas from the august professor down the hall and then tried to claim them as his own. When the truth was, it may have been the other way around. Gould settled in his chair, thinking that if he won this thing, it would not only fill his pockets and bring his long ordeal to an end, it would force the keepers of the grail to rewrite their scientific histories. He wanted that more than he was willing to admit. The snowy-haired Goodrich stood near the railing of the witness stand and asked Gould to tell the jury a little bit about himself. Gould leaned toward the microphone. He described his early life, his studies, his early attempts to make inventions, his return to graduate studies to learn physics when he realized he didn’t know enough. He spoke quietly, matter-of-factly, until he began describing that November night in 1957. Now something stirred. Gould, reliving the moment of his discovery, transformed in the witness box. He shed years of age and foot pounds of stress. His eyes shone and his voice crackled.